The Smittybilt XRC Armor Corner Guards are built by hand from tough steel for true off road durability. 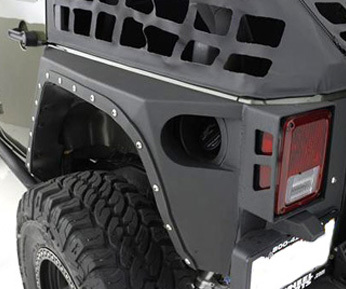 Get full 360 degree protection of your vehicle with Smittybilt Smittybilt XRC Armor Corner Guards JK. The Smittybilt XRC Fender Flares are made of 100% Steel and can actually increase the suspension articulation of your Jeep Wrangler JK. Smittybilt's XRC Body Cladding offer the ultimate in body side protection for your Jeep Wrangler JK & Jeep Cherokee XJ.